The combination of powerful engineering workstations with advanced modeling allows designers to find and correct potential design flaws earlier in the product development cycle. In today’s fast-paced product development cycle, being able to visualize key design elements, simulate complex requirements and communicate the form, fit and function of a design is critical. Just as rapid prototyping vastly accelerated the pace of product design and development, immersive technologies such as photorealistic rendering, interactive simulation and virtual/augmented reality allow design engineers to innovate faster, with more confidence. Immersive design is also the catalyst for clearly communicating design intent to partners and decision makers. The two flies in the immersive design ointmenthave always been cost and complexity. Before now, a computing solution capable of intense, photorealistic rendering or VR was out of reach from many. Likewise, the complexity inherent in yesterday’s simulation and analysis software relegated it to the domain of a select few experts. But things have changed. Modern workstations—even some mobile workstations—equipped with fast CPUs and discrete GPUs—are capable of real-time rendering and interactive visualizations without breaking the bank. Simulations can be launched directly from most popular CAD packages. Software vendors have made great strides in ensuring simulation tools are easy to use, while hardware vendors have worked with software providers to ensure simulation runs are finished as quickly as possible—sometimes even providing realtime visual feedback. 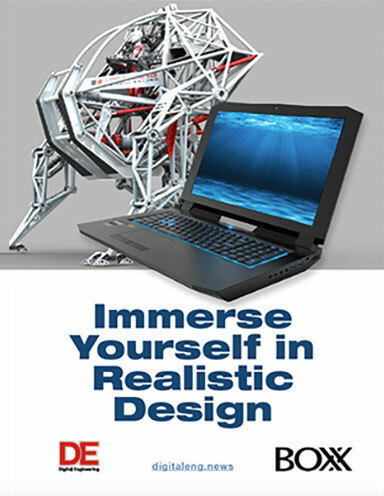 The bulk of the design, simulation and production of the 8,500-pound mech suit/racer was managed from a single BOXX GoBOXX MXL mobile workstation using SolidWorks. This new workstation delivers the best price/performance.